As you could expect, the Digital Belt Textile Printer MT-Belt1201Plus provides industrial production capabilities with the highest printing quality and reliability. The printing system was designed for non-stop production that achieves maximum resolution of 1200dpi and with the maximum production speed of 88㎡/h. Otherwise, The Digital Belt Textile Printer MT-Belt1201Plus owns the maximum printing width of 1800mm and equipped with the latest Xaar1201 printhead (5113 is optional). MT-Belt1201Plus Digital Belt Textile Printer adopts top class Xaar1201 high precision printhead, resolution is 1200dpi with two years life span, which suits for big lots, continue and unstoppable textile fabric printing industry production. And Xaar1201 Printhead supports for multiple ink technology and suitable for a variety of fabrics,For example, Reactive ink is suitable for printing cotton, linen, and hemp, silk, wool fabrics, Sublimation ink is suitable for printing chemical fiber fabrics such as polyester, Pigment ink is most of the fabrics are available! efficient print jobs can be accomplished and satisfy even the most discerning customers, thus MT-Belt1201Plus Digital Belt Textile Printer enhance the productivity! MT-Belt1201Plus Digital Belt Textile Printer can compare the printing speed, printing quality and printing stability with imported Japanese digital textile printer brands like, Epson printer, Roland printer, Mimaki Printer and Mutoh Printer. Because of Four Xaar1201 high precision printhead ranked as four-row on Digital Belt Textile Printer MT-Belt1201Plus. MT-Belt1201Plus Digital Belt Textile Printer provides fully guarantee for printing precision and stability by applying high quality THK guide rail, aluminum crossbeams, servomotor and stable rack. Especially, it adopts THK 20mm width Linear Guide Rail with two slide blocks that can efficiently increase rigidity and torsion resistance, higher precision and mute silence during printing process. The THK Micro Guide Rail and Screw Rod are introduced to carriage lifting system to deliver easier adjusting and higher precision printing. There are various textile ink can be used by MT-Belt1201PlusDigital Textile Printer, such as reactive textile ink, dispersive textile ink, sublimation textile ink and pigment textile ink which are good matching for cotton, linen, silk, nylon, wool, polyester and chemical fiber etc. MT-Belt1201Plus Digital Belt Textile Printer equipped with accurate tensile force and professional belt transmission system for media feeding and taken-up to ensure the feeding error rate less than 0.3%, which provides stable and hi-effective fabric feeding process. Professional belt transmission system is also equipped with automatic cleaning, drying, and automatic correction system, to guarantee the belt surface clean and printing precision during continuous printing process. 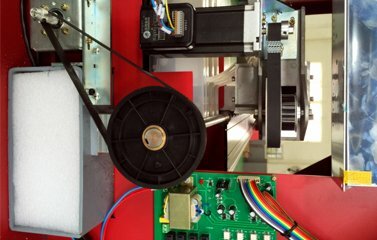 Otherwise, the belt can be cleaning, heating and adjusting during printing process automatically ! Therefore, MT-Belt1201Plus Digital Belt Textile Printer is suitable for a wide range of fabrics printing and overcome the difficulties of materials slant and pleat occurring during printing. This feeding system is 100% suitable for elastic fabric; it also can transit cloth material stably to ensure high speed printing. The sublimation heater is optional for MT-Belt1201Plus Digital Belt Textile Printer. The heater equipped with far infrared ceramic tube radiation electro thermal system, which is controlled by intelligent PID temperature control system that heat up super quickly and its precise sealing heater body can ensure the constant temperature during sublimation textile fabric. Meanwhile, the digital tension control system also equipped on this sublimation heater that ensure textile fabric feeding and taking up are synchronously. Also, the advanced thermal energy technology saves energy consumption (electricity, water) compares with traditional hating method. The independent Exhaust system is optional for MT-Belt1201Plus Digital Belt Textile Printer, which collects and processes emission tail gas without any smell, good for environmental protection and the tail gas is become to normal temperature from the hot air after filtration through the cooling system that ensure the exhaust system temperature always less than 25 degree. Otherwise, the exhaust system adopts drawer type device that convenient replace activated carbon to ensure emission tail gas harmless! MT-Belt1201Plus Digital Belt Textile Printer adopts independent intelligent printhead cleaning and moisturizing device that provides safe and convenient printhead cleaning and maintenance function. The suction facility and printhead scrape device keep printhead unclog, clean and non-air bubble which improve stability status during digital sublimation printing. Moreover, the printing thickness is also can be adjusted depend on various textile fabric which is up to 15mm. Digital belt textile printing is a brand new textile printing concept which Unnecessarily plate making but printing on textile fabric directly. This new printing method leaves out sublimation heat transfer process. Digital Belt Textile Printer MT-Belt1201Plus integrates Material loading, feeding, printing, drying system as a automatic production line. So that, only one operator can operate several digital textile printers with highly efficiency and the highest printing performance. Digital belt textile printing is suitable rapid speed production for home textile, clothing material, flags, banners and various textile fabrics. There is broad market prospect and unlimited business opportunities on digital belt textile printing industry.